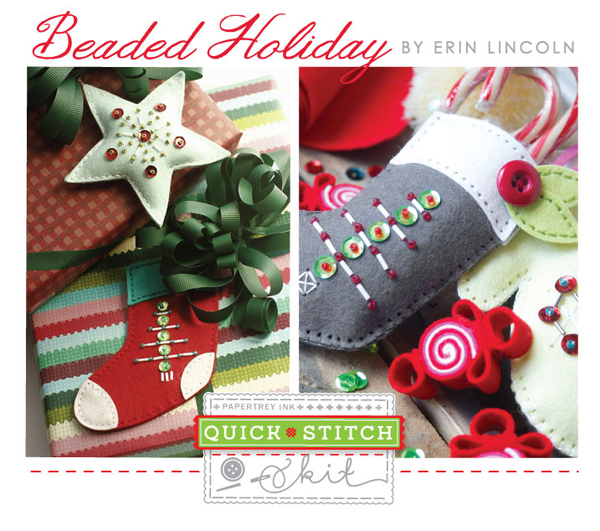 Papertrey Ink's third Quick Stitch Kit will be released on September 1st and it is entitled "Beaded Holiday". This kit reminds us of days gone by. When women spent quiet evenings by the fire, doing handwork. A time when handmade was best. 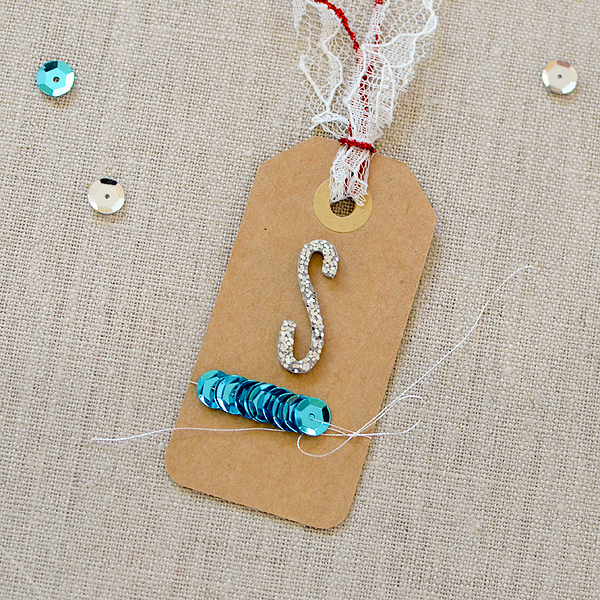 The basic holiday stitching shapes in Beaded Holiday can be used for so many different types of projects, everything from keepsake gift tags, to tree ornaments, to holiday garlands. 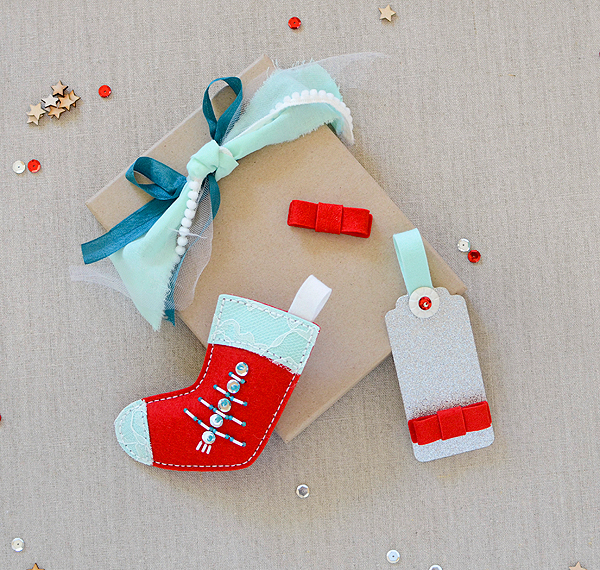 Think gift card holders, holiday party favors and more! 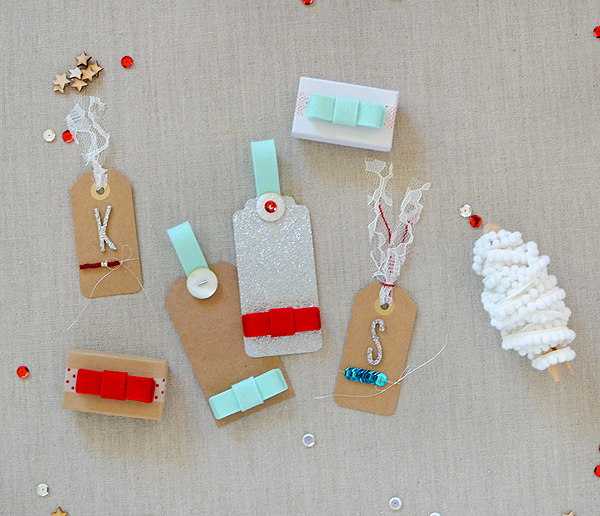 Erin even has you covered when it comes to decorating your holiday stitching projects. 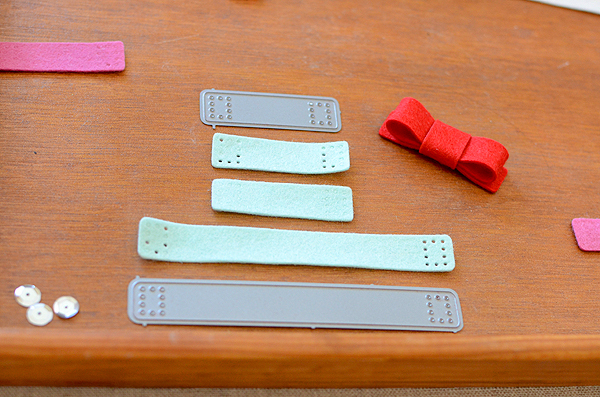 The clever beaded motif dies pre-cut all of your holes so the beading process is a snap and perfectly precise. 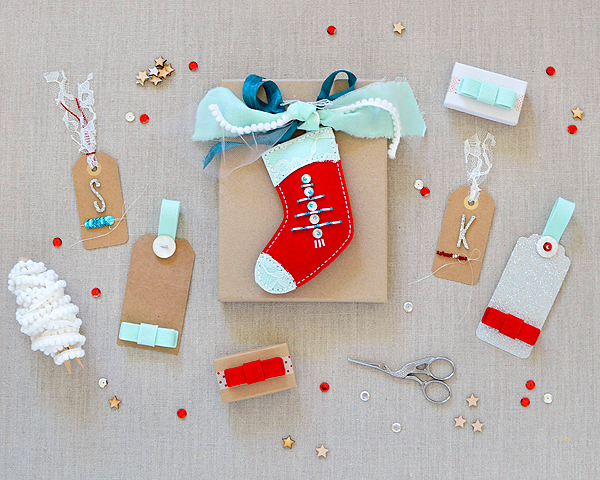 Get your kit tomorrow night so you can get a head start on holiday projects! The total retail cost of the "Beaded Holiday" Kit is $105. There will be a limited number of these exclusive kits available, so be sure to get yours while you can! 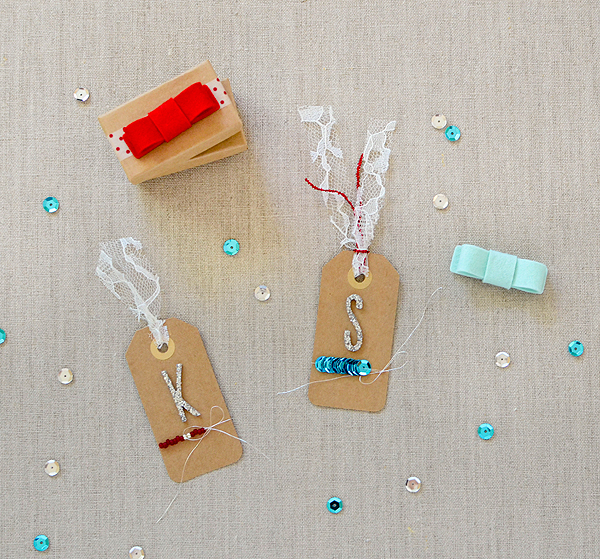 The Beaded Holiday: Garland dies are the ONLY item from this kit that will be available for purchase separately at a later date. All other items are limited edition to this kit and will never be offered again! "Beaded Holiday" Kit will be available for sale beginning on September 1st at 10pm EST, only at Papertrey Ink. Read all the details on Nichole's blog or contact Customer Service with any questions. It's that time of year when crafty companies are beginning their festive releases. While I always think that I'm in no mood for Christmas in August when our sizzling hot weather is only just beginning (at least the way these past few years have gone), I always end up getting pulled into the vortex of holiday spirit and generally stay there until January! So with the PTI Quick Stitch kits being my premiere holiday party for 2015, I'm wishing it was cold enough here to light candles and drink hot cocoa as I head down into a rabbit warren of holiday projects. 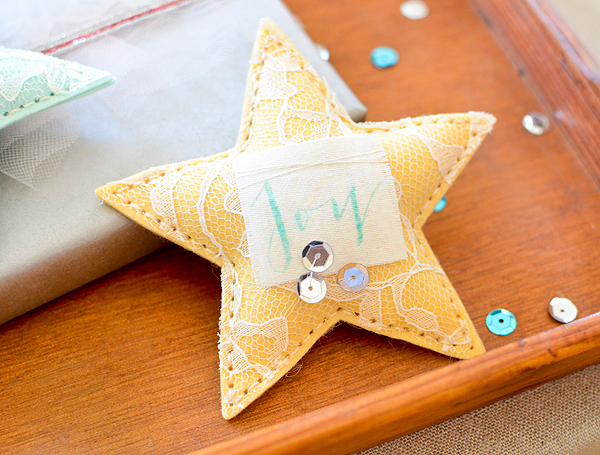 The idea here was to make these stars to give as tree ornaments or package toppers, and because they have mostly ambiguous sentiments, when Christmas is over, they can be kept on display all year. I was particularly fond of the 'dream big this year' and 'out with the old / in with the new' messages from the Happy New Year stamp set. 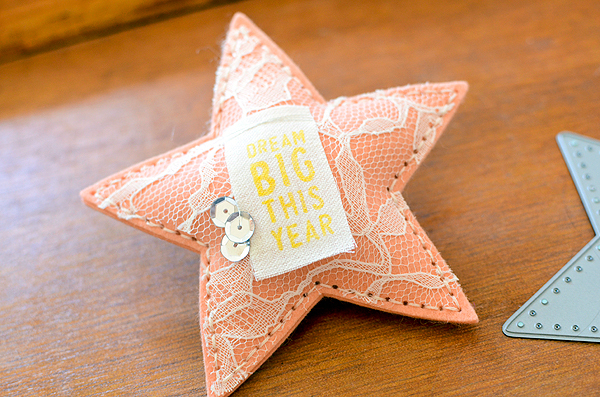 So many of us have such big dreams and plans for a new year and these little stars can hang from or sit on a shelf as a reminder of those aspirations. One thing I always love to do when I receive my QSK is look over all the contents and decide how else to use them. I think that's important with any kit or supply, for that matter, because they're more useful when you can do more with them, right? So the good news about September's QSK is that even though it's called Beaded Holiday, you don't have to save it just for holidays! You're also not obligated to only make a garland with the garland dies, nor must you save your sequins and beads for the delicate motif handwork (though you can if you'd like ;). 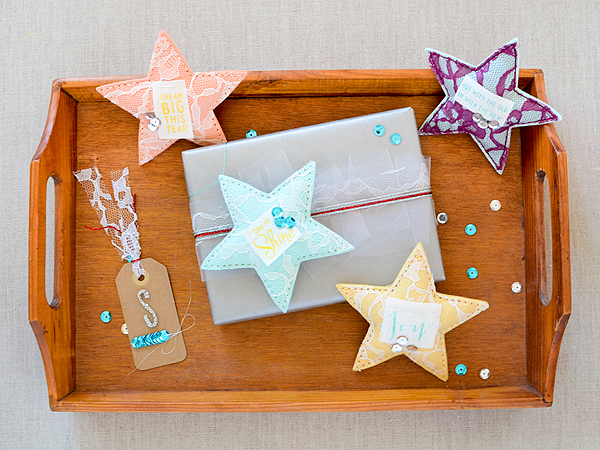 The star die is completely versatile because you can have stars at any time of the year; you've seen what I did with them, and if you prefer a more traditional holiday look, simply change the colors to red and green and switch to more festive sentiments. 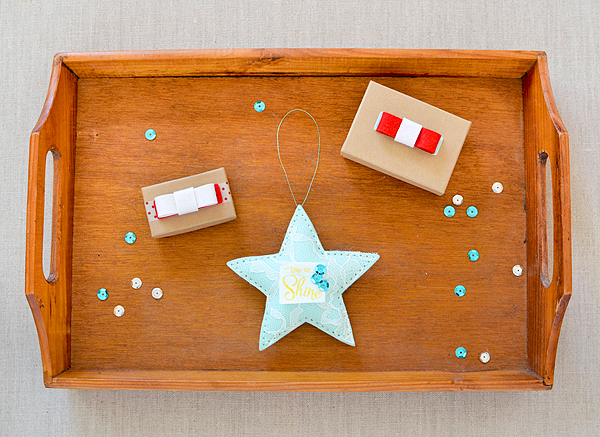 Aside from the star, the garland dies, in particular, have a plethora of uses. 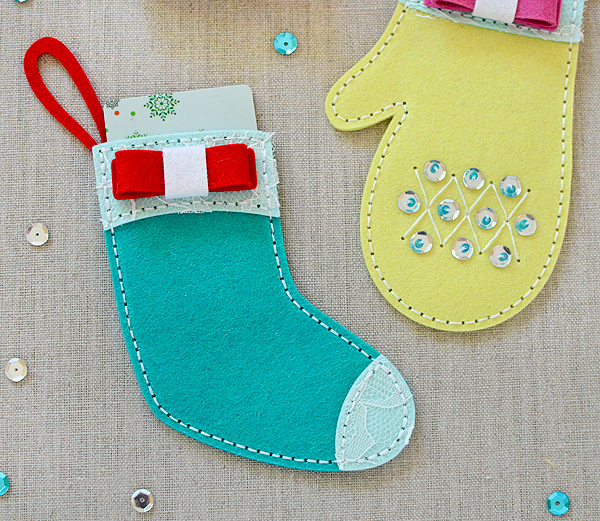 How about stitching the loops to ornaments or gift card holders to hand on the tree or a package? 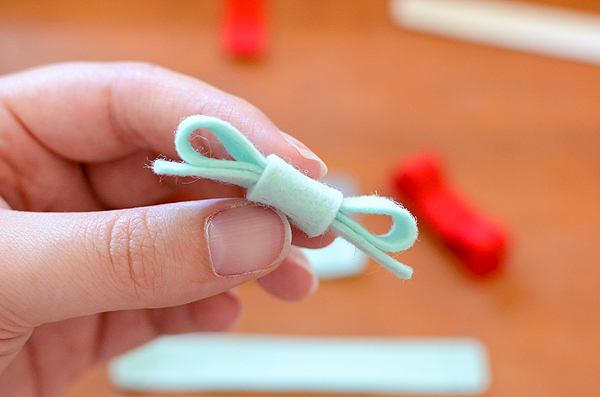 I even made little decorative bows with them. 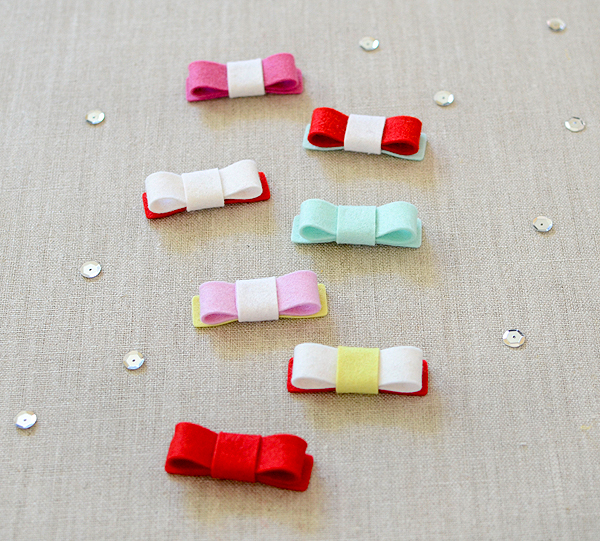 Let's discuss the bows first--I've fallen so hard for bows lately, and everything is cuter with a bow on it, right? Especially at Christmas. So when I realized how easy it was to make a bow out of the garland dies, I made a bunch of them and used them everywhere! I'm not sure if Erin knew they could be turned into these beforehand or if this was a just a happy a-ha moment for me, but I consider it a huge bonus! Cut 2 short garland pieces and 1 long one. 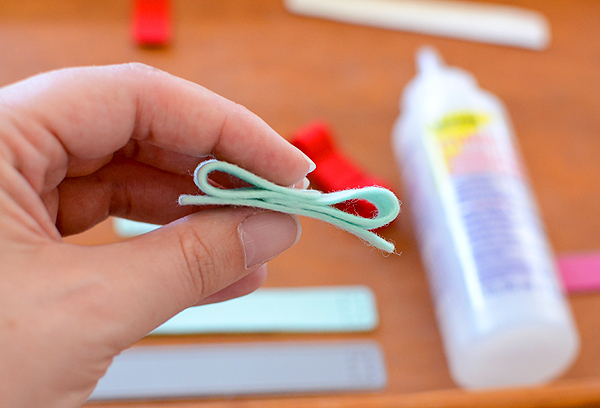 Last, take the 2nd short piece and wrap it around the center of the bow, adhering it in place on the underside. That's it! So easy, right? 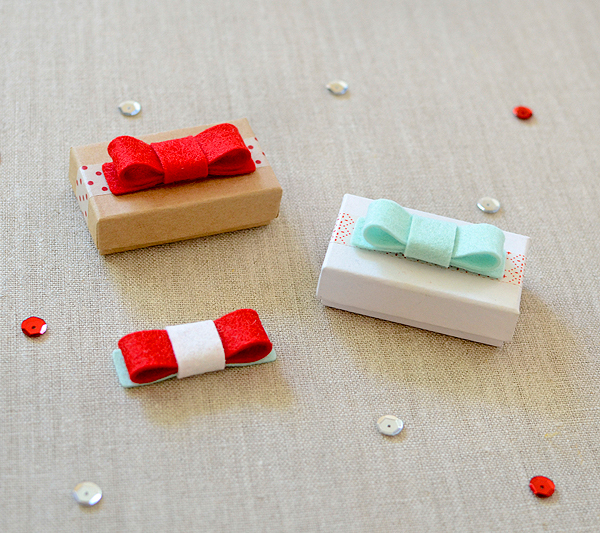 You can now make lots and lots of bows for lots and lots of pretty packages. 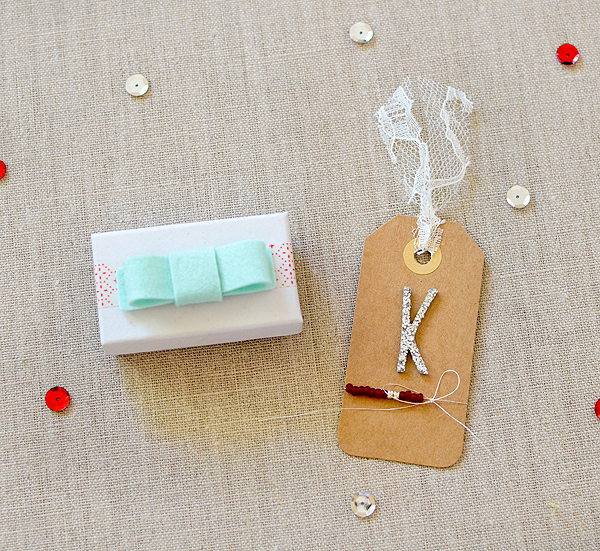 Bows do not have to be saved for holiday-only occasions, either! After the bows came the loop. You can stitch a loop to anything. 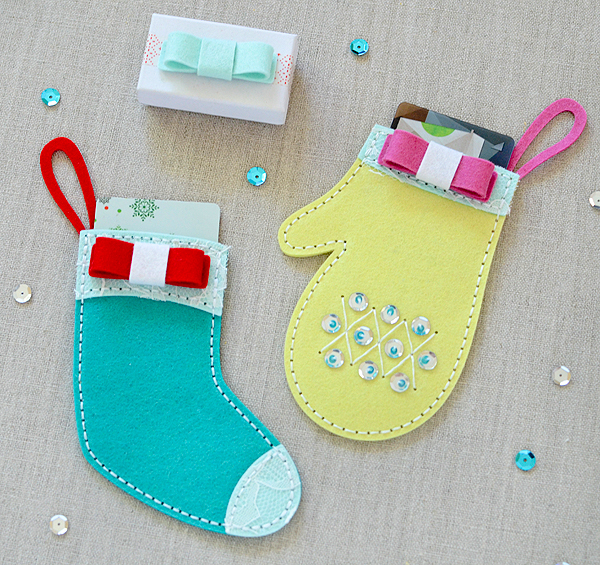 I know that both the mitten and the stocking came with a cute loop die all their own, and you'll see a bit later that I did indeed use them. 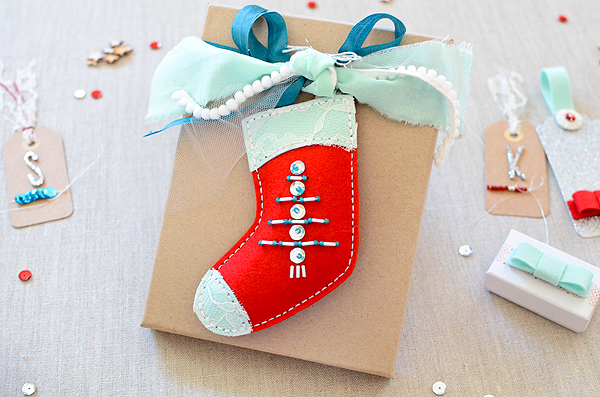 However, I also used the longest garland die to make a different loop for my stocking package topper. I used the stitch guides on the ends to sew it into my stocking, lining it up with a few holes in the bottom of the cuff line. Because it was not made as a loop for the stocking, it won't fit seamlessly together, but it's firmly in place and since all the stitching is inside the stocking, it's unnoticeable on the outside. I can now tie it firmly to the bulky trims on my package and I know it's going to stay put! 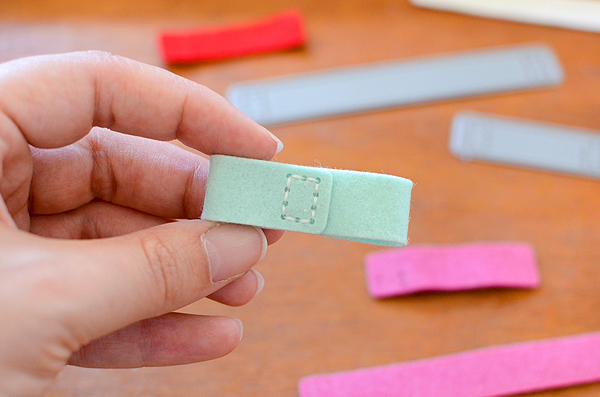 I love using lots of different textures on my projects so I was happy to use the long garland die again to make felt loops for paper tags. 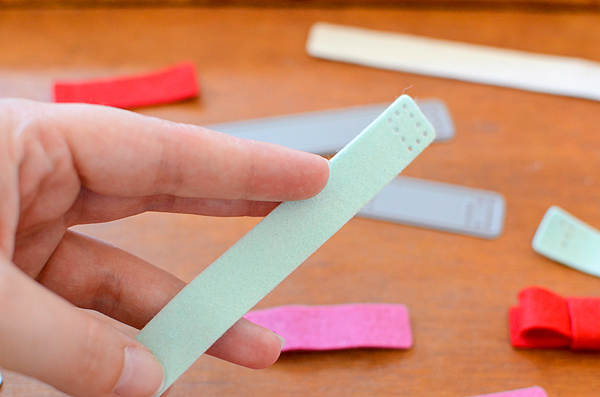 These I glued in place with Fabric-Tac instead of stitching, though that is always another option. Instead of sewing, I covered the loop ends with buttons, sequins, and beads for the added bit of glitz. 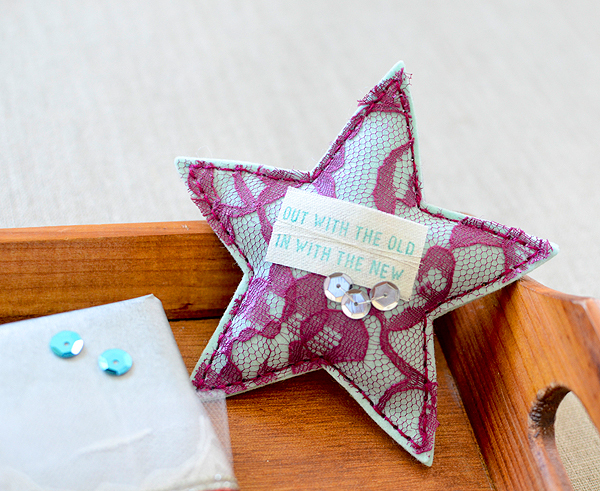 I got a little carried away with the projects because I ended up using the sequins and beads for more tags--but I really wanted to stretch the kit and show you as many ways as possible to use all of the contents. Forgive me. 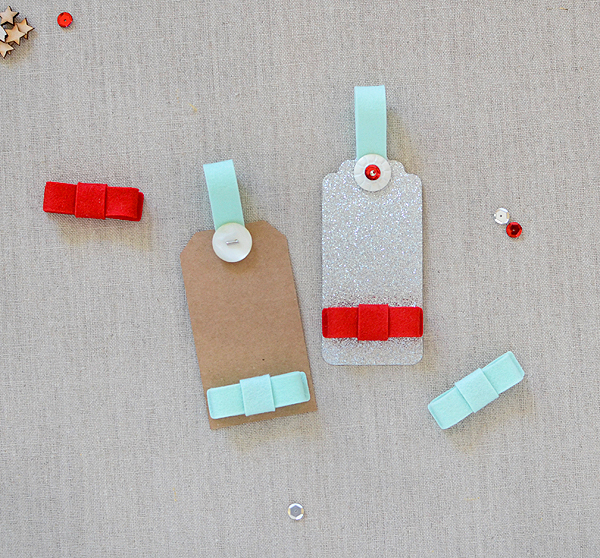 Of course, I had to make some gift card holders, too! My love for wrapping gifts has surpassed my love for any other type of crafting (except maybe making tags), and I put making gift card holders in that category, as well. 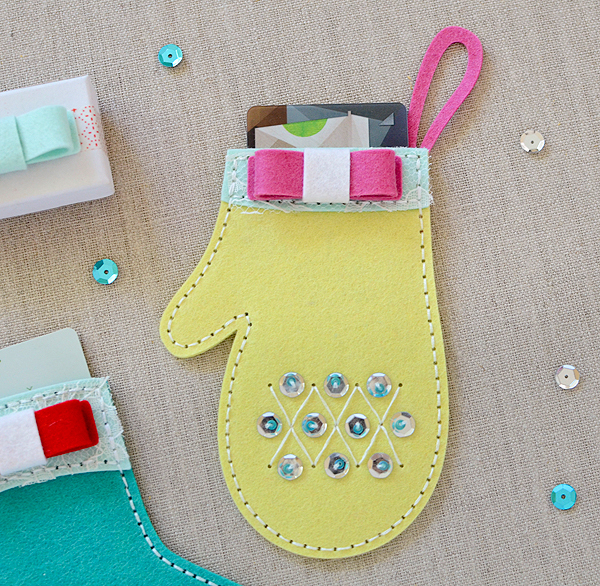 I'm always in search of all kinds of 'pockets' that will fit a gift card so the stocking and mitten absolutely HAD to be made into gift card holders! 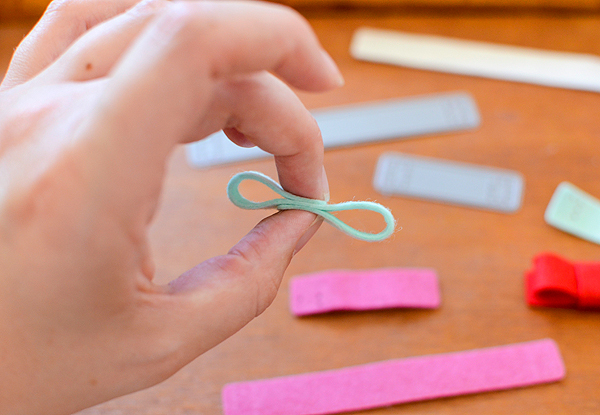 They are so easy to make, too! I made these for my young nieces so I used slightly nontraditional colors, though I did manage to get the red and the green in there anyhow. I guess I got on kind of a lace kick with all of my projects because I used it again here on the cuffs and stocking toe. I was trying for a cohesive feel throughout the entire suite and mixing elements (like the lace and the bows), because I actually intend to use all of these pieces on my holiday gifts this year so if there are like elements on every piece, it's easier to mix and match when December arrives. 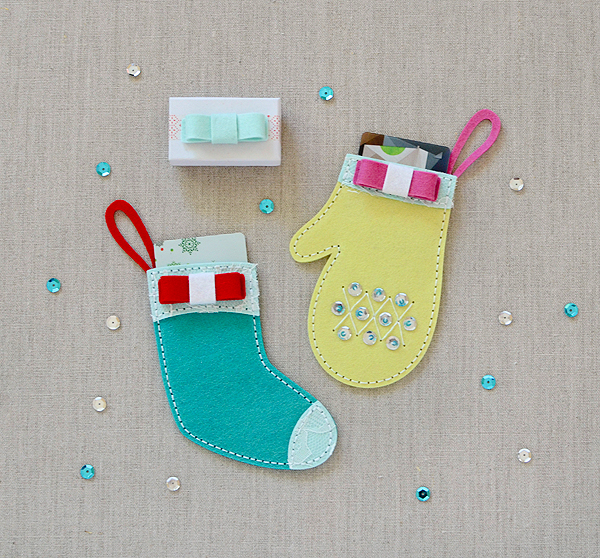 I opted for a simple beading pattern on my mitten, using the silver sequins and teal beads. The pop of Autumn Rose against the Spring Moss and Aqua Mist is so feminine and cute for a little girl. And, well, that bow! Don't forget, the kit goes on sale September 1st at 10pm EST. You can find all the details on Nichole's blog and please be sure to check out the rest of the gals and their gorgeous projects! You are so creative! 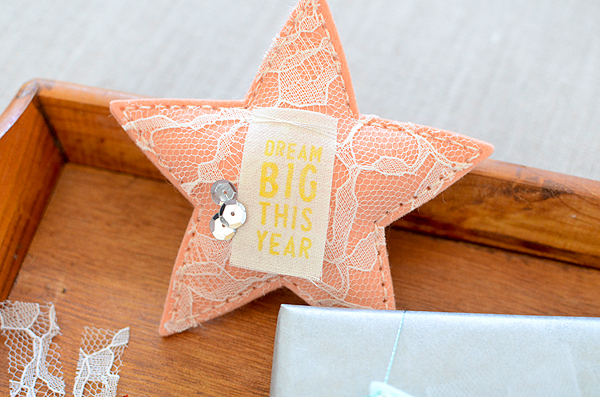 I love the lace stars!! And the bows! Love how you added the lace! Wonderful projects! The bows are adorable! So sweet! Love all your photos!